Today I am pleased to host an interview with creativity coach Sue Mitchell, “The Memoir Muse,” about the challenges new lifestory and memoir writers face and some tips on avoiding them. SL: You explain on your website that your passion is to help people overcome obstacles and reluctance to begin or continue writing their memoirs or life stories. What are the most common obstacles people bring to you? SM: Most clients come needing some form of outside approval. They want to know if their writing is any good. They wonder if they’re going about this in the “right” way. They worry about offending others by sharing their view of what happened. I help them understand the messy nature of the writing process, teach them to set their own criteria for success, and help them give themselves permission to tell their stories. It’s also typical for beginning memoir writers to find that writing a memoir competes with other priorities in their lives, time slips away, and they don’t get to their writing as often as they’d like. Using the Japanese principle of kaizen, we establish routines and build momentum so they can make more consistent progress on their memoir project. SL: Do you draw a distinction between the process of writing and the product? How does this influence the way you work with clients? SM: When a writer focuses on their process, they are noticing what they’re doing and how they’re doing it. They are experimenting and learning from their trial and error. They’re observing the satisfaction of creating a well-turned phrase and the emotional release of self-expression. They assess their level of motivation to work on their project and seek inspiration. They’re driven by curiosity and enjoyment. When writers focus on their product, they’re considering the quality of the work. They’re putting themselves in others’ shoes and wondering, “What will they think?” They’re driven by a desire to meet a certain standard. If you want others to benefit from what you’ve written, there is definitely a time to place your attention on the product, but it’s dangerous for a writer to worry about that too early. Focusing on the product too soon can inhibit creativity and feel discouraging to the writer. SL: I’ve been noticing a trend over the past few years in the memoir community to focus increasingly on publication rather than the process of writing. How do you see this affecting writers, especially beginners? SM: I’ve noticed the same trend. Now that self-publishing has become so much easier, it seems like everyone wants to do it. The idea of having a published book is very appealing. But again, thinking about how your work will be received by others too early in the process can lead to creative blocks and even quitting. It can also be overwhelming for someone just getting started to mingle with other memoir writers and hear them talk about building a platform, ISBNs, query letters and such at a time when the novice just needs to know what to do first! It’s important that writers find a community of writers who aren’t too far ahead of where they are. Unfortunately, many writers come to internet forums as a way to build their author platform, so I think those who are nearing publication far outnumber the beginners in those communities. That can make it seem, in online circles, like publication and platform-building should be everyone’s main focus. Not true. 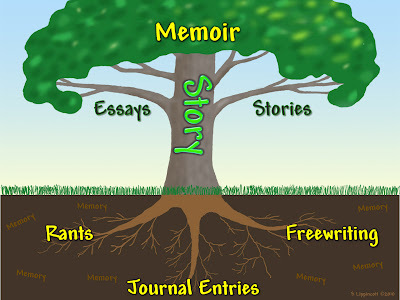 Besides, there are so many personal benefits to writing a memoir even if you never publish it, and I worry that many writers don’t benefit from telling their stories because they think no one will want to read it. Seeing publication as the only worthy goal means that people are missing out on the benefits of simply doing the writing. I started my business, An Untold Story, to create an internet community focused on the creative process as it pertains to memoir writing because I noticed there wasn’t much conversation about that happening online. That’s why I was so excited to discover your work, Sharon. I love the way you focus on enjoying the process and doing the actual writing. SL: What is the most important piece of advice you can offer new life writers? SM: It may sound crazy, but my best advice is to lower your expectations of yourself and your writing. Set yourself up for success, not disappointment. When you’re establishing your writing practice, start small. You’d be amazed at how much you can accomplish in 10 minutes a day if you stick with it for a few weeks. Let your writing be awful in the beginning. Give yourself permission to write a bunch of disjointed pieces and practice feeling comfortable with not knowing how it will all fit together in the end. Lower the pressure on yourself to be a great writer or to complete a certain amount of writing within a specific timeframe. Take small steps, experiment, learn and enjoy the process! SL: Thank you Sue for sharing these insights and tips! As “The Memoir Muse,” Sue Mitchell will inspire you to finally write your memoir by giving you the tools, support and confidence you need to succeed. She is a lifewriter, teacher and certified Kaizen-Muse Creativity Coach. Sue lives with her husband and son in the high desert of Colorado, where she enjoys hiking, river trips and painting. Request her free Memoir Starter Kit at www.AnUntoldStory.com. Excellent interview Sue and Sharon! I appreciate your focus on taking time to enjoy the process before worrying about the product. There are so many stages and phases to the memoir writer's journey --moments of self-discovery, insights,etc--it is so important to let it unfold rather than to rush it. I have found that the story that needs to be told usually reveals itself if we show up, listen and ,of course, keep writing. Thank you both for an insightful and informative interview. Thanks for your thoughts Kathy. I'd add one more thing to your list of showing up, listening and writing: sharing writing with others -- they can see the holes we are blind to in our own work. They can tell us where they want to hear more, where we need to dig deeper. I like the idea of setting yourself up for success, and taking baby steps. When you break down a book, any book, into small - even tiny - sections, it makes the whole seem more achievable. For instance, writing 500 words a day will permit you to write a novel in a few months! Thanks for that reminder Lorraine. I consolidated forty-eight blog posts into a book. Even at one post a week, that only takes a year. Oh, I left a reply for you on my blog. Please read it!